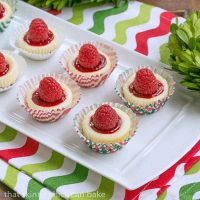 Mini Mascarpone Cheesecakes are unique homemade cheesecake desserts, perfect for your holiday dessert buffet. Top with a single raspberry and watch them disappear. I make variations of these mini mascarpone cheesecakes for all sorts of events. Some with graham cracker crusts, others with chocolate cookie crusts and now these, with Biscoff crusts. Flavored with a bit of dark chocolate, plain old vanilla, or the extract of your choice, they are two bite, scrumptious little numbers. 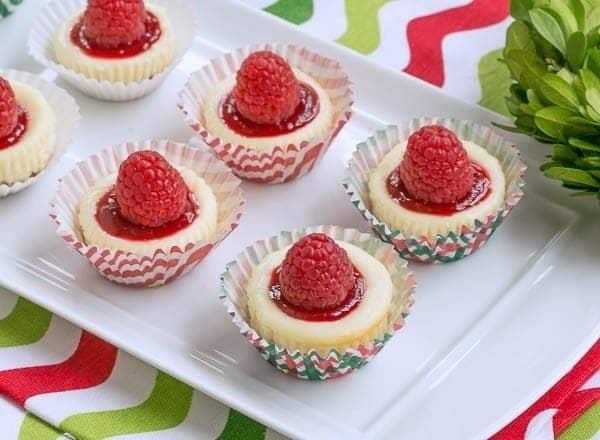 To jazz the mini mascarpone cheesecakes up even more, I topped them with small dollops of raspberry coulis and perfectly plump red raspberries. But I’ve also decorated these babies with dark chocolate and white chocolate ganache crowned with colorful M & M’s. Red and green candies are perfect for Christmas, but fall colors work for Halloween and Thanksgiving or pastels for Easter. You get the picture. Then I shook these up even more by adding some of my homemade mascarpone for an Italian flair. Plus I stripped them of their dull white paper baking suits and set them into festive holiday wrappers. To ease the removal process, freeze the mini cheesecakes, then remove the original cupcake liners. They look ready for our Progressive Eats Holiday Desserts party today, don’t they??? I have loads of cheesecake recipes on this blog, and over the years I’ve found a few key steps that will make your cheesecake the creamiest, most luscious dessert you can make. First, you must get out your refrigerated ingredients 2 hours before you plan to mix them. This is especially important for the eggs and cream cheese. PRO-Tip: Having the ingredients at room temperature allows them to mix in smoothly. You want the cream cheese totally incorporated, with no tiny white bits in the batter. PRO-Tip: It’s also imperative not to over-mix the batter. So if you see white bits in your batter, resist the urge to turn your mixer on high and beat the batter to death. Overbeating will add air into the mixture, thus changing the texture of the cheesecake. PRO-Tip: If you’re using a stand mixer, always mix with the paddle attachment. It will mix your batter without adding any excess air, making a dense, creamy cheesecake. Add your eggs one at a time, and mix just until each is incorporated. When I bake a full sized cheesecake, I bake in a bain marie or water bath to help prevent cracking of the surface. 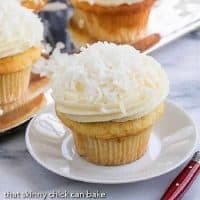 With minis, it’s not needed as these don’t tend to crack plus the tops will be garnished! Feel free to garnish however you like. The toppings can be customized depending on the time of year, holidays, etc. We have a core group of 12 bloggers, but we will always need substitutes and if there is enough interest would consider additional groups. This month’s theme is Great Holiday Desserts hosted by Jenni of Pastry Chef Online. Cookies, cakes, pies and more for your holiday party planning! Jenni is the one to contact if you ever have a baking conundrum. 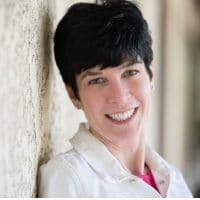 Besides being a stupendous baker, she’s kind, generous and hilarious. 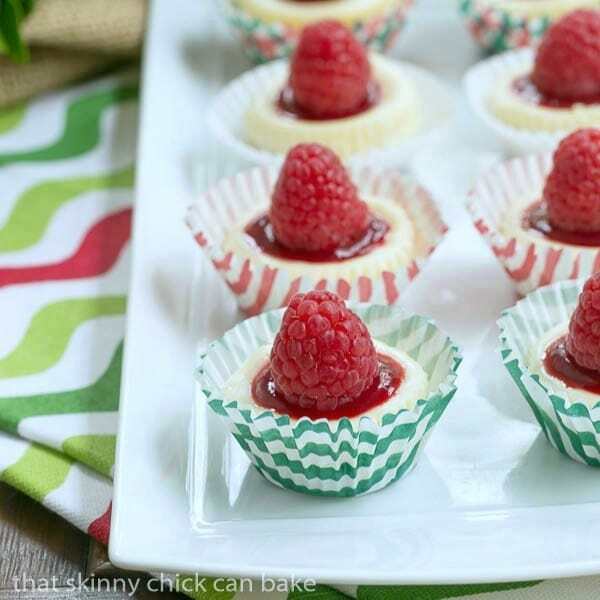 Versatile mini mascarpone cheesecakes! Garnish to suit your whim! Line mini muffin tin with 20 paper liners. Set aside. Mix cookie crumbs and melted butter. Place 1 teaspoon into the bottom of each lined muffin cup. Tamp it down to cover bottom of cup and to compress the crumbs. Set aside. With an electric mixer, beat cream cheese and mascarpone in a medium bowl till smooth. Mix in sugar, then vanilla. Mix in the flour. Add egg and beat till just combined. 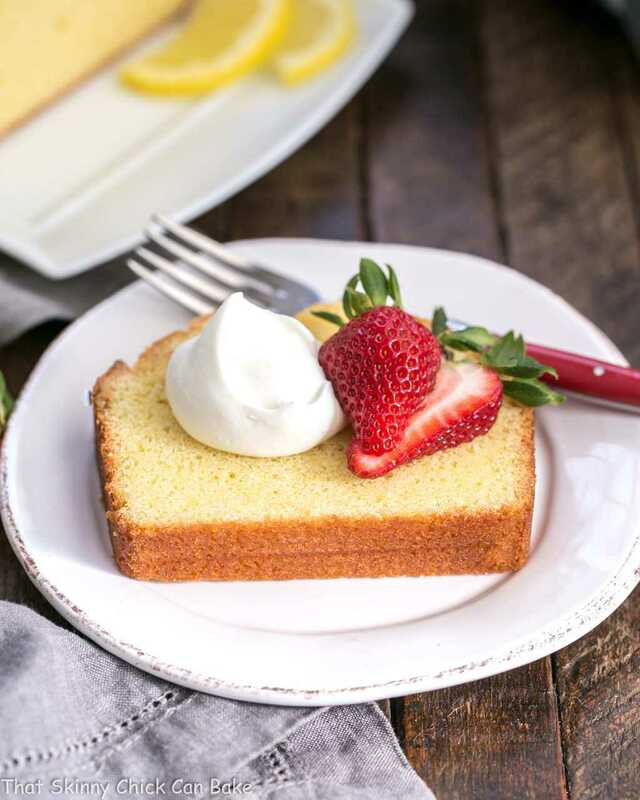 Scoop out rounded tablespoons of batter and carefully place over crusts. Smooth tops with offset spatula. Bake for 18-20 minutes till puffed, but not browned. Remove from oven to cooling rack. When cool, remove cheesecakes from tin to decorate. Top each with a small dollop of raspberry sauce and one ripe raspberry. 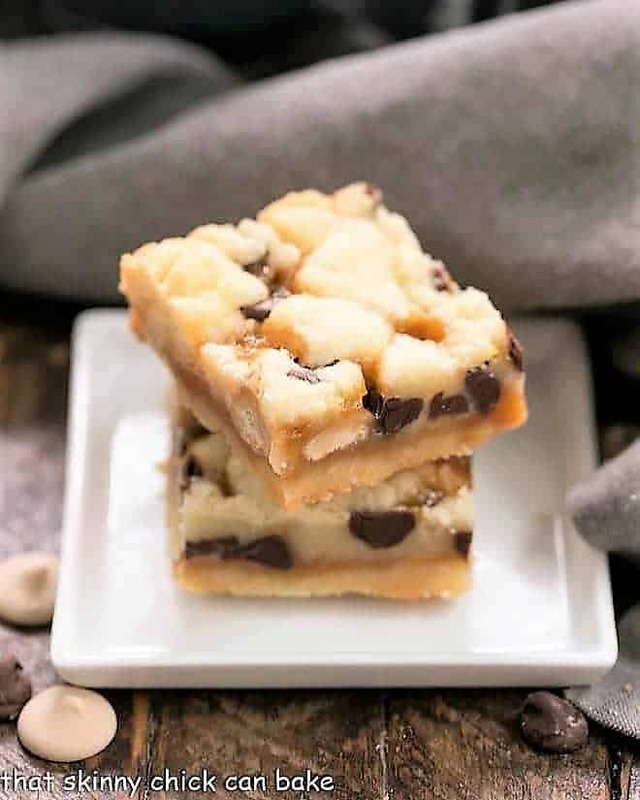 Alternatively you can make a white chocolate ganache by melting 2 ounces chopped white chocolate and 1 tablespoon heavy cream and use instead of the raspberry sauce. Perfect little bites, Liz! And I am impressed that you made your own mascarpone! I have yet to delve into cheesemaking, but if these guys are at the end of the journey, I might have to get started! So cute! Mini desserts are the best for the holidays! Love these mini-bites Liz – they’re beautiful and perfect for any holiday dessert table! Aww Lizzy what besutiful and cute treats!! These are so cute – picture perfect! So fun for the holidays. I love your tip about freezing them to make removing the wrapper easier. Love your mini cheesecakes, I wish they disparated en 1 minute! They are so cute ! These look great! I love mini desserts. I’ve never made mascarpone cheesecake but it sounds delicious. Love it, Liz. 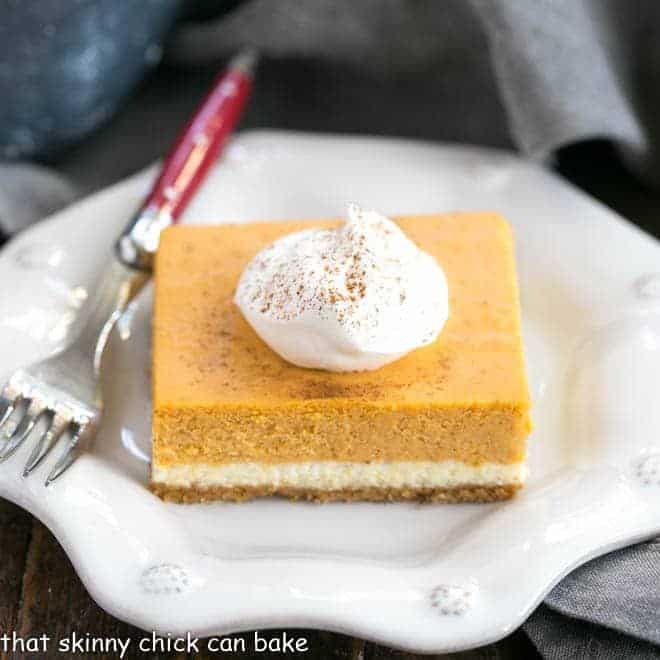 I’m a big fan of mascarpone and these cheesecakes are too cute and delicious! Dear Lizzy, That certainly looks delicious; perfect for the holiday table. These would be perfect for my holiday table! They are so pretty and I am sure they are tasty. Have a wonderful Thanksgiving! I have a coworker who does a family progressive dinner every year during the holidays. I love the idea! Hi Liz, these mini cheesecakes look delicious, perfect for the holidays! These really grabbed my attention because I made something similar myself last weekend. Yours look absolutely perfect! I love anything ‘mini’, not least because you can eat them without guilt. 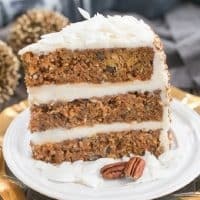 What a great recipe for the holidays! Very festive, indeed! These look perfect for the upcoming season! These are just adorable. Perfect for a cocktail party! I love mini desserts like these, they are so pretty too. I’m not sure we have biscoff here, I’ll have to look into it. Liz, these are so pretty, festive and adorable! Leave it to you to make your own mascarpone 🙂 You’re a machine in the kitchen! Puuuurfection! Love the versatility of these gems. And your Italian versions looks very Christmas cheery, too! I was awestruck at Homemade Mascarpone!! Amazing looking mini cheesecakes, Liz! I’m going out this weekend and I’m taking these with me. I’m in love. Liz, I’m all about the mini desserts for the holidays! (this means I can eat more and more variety! :)) love the Biscoff cookie crusts and I’m still in awe that you made homemade mascarpone!! love these! Just gorgeous, I love the raspberry topping! 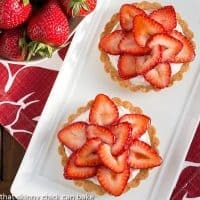 These bite sized cheesecakes look incredible! These are incredibly adorable! Love them! Plus marscepone is AMAZING!! These would be gone in seconds! These are adorable and so tempting…. I want to just pop one or two in my mouth so perfect for a holiday dessert buffet! And I love that you cut the cream cheese with mascarpone! Very festive and the perfect addition to any dessert table! Biscoff cookies with cheese = wonderful combination!! Yum! Love mini bites cause you can eat more than one and not feel guilty! Going to make these for Easter! Love that they are bite sized . The perfect bite! Love that these cheesecakes can be finger food. These are so pretty Liz! Love the mini size! I have never met a recipe that I don’t like that is made with mascarpone and raspberries. And this one is no exception. SO GOOD! I loved these! 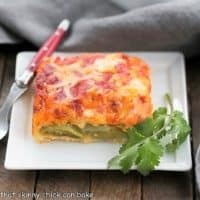 Really delicious and easy to make!